“The Transylvanian Saxons (or Die Siebenbürger Sachsen as they are known in German) are the most significant ethnic German group of Romania. They are part of the broader Romanian-German ethnic group (known in German asRumäniendeutsche) alongside the Bukovina Germans (indigenous to Bukovina, north-eastern Romania), the Banat Swabians (indigenous to Banat, south-western Romania), the Zipsers (or Zipser Germans; indigenous to Maramureș, north-western Romania), the Dobruja Germans (indigenous to Dobruja, south-eastern Romania), the Bessarabia Germans (indigenous to Bessarabia, currently divided between the Republic of Moldova and Ukraine), the Transylvanian Landlers (expelled Protestant Austrians from Salzkammergut) as well as the Sathmar Swabians (the only ethnically Swabian group of the Danube Swabians). They are the oldest ethnic German group from Romania, with a long standing history and a significant presence in Transylvania spanning for almost a millennium. Their historical presence on the territory of modern day Romania is filled with many significant achievements, contributing as such to the creation of a unique cultural space at the crossroads of Central and Eastern Europe and to the subsequent modernisation of the Romanian state. Some of their settlements, the fortified churches, citadels and castles are listed as UNESCO World Heritage Sites, all of them being built and further fortified throughout the Middle Ages. Ethnically, the Transylvanian Saxons (as paradoxically as it might seem) are not entirely Saxons in origin. 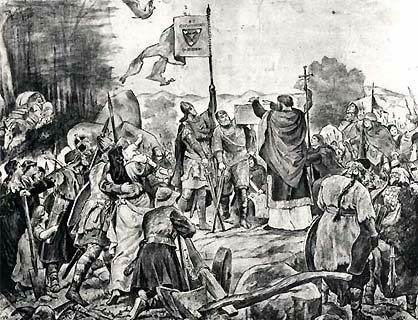 Their history in Transylvania commences in the mid 12th century when they were given land by the then King of Hungary Géza II in the purpose of defending the eastern frontiers of the Kingdom of Hungary (which at the time comprised Transylvania as well). The origins of the Transylvanian Saxons can be geographically traced to Rhineland, where they mainly come from. Aside from Rhineland proper, the first waves of German settlers in Transylvania also stemmed from various other zones of Central and Western Europe such as Thuringia, Bavaria, Flanders, Wallonia and even modern day France. A significant part of the colonists emerged from modern day Luxembourg as well, which explains why the Transylvanian Saxon dialect (known in German as Siebenbürgersächsisch or Die Siebenbürgisch-Sächsische Sprache, literally meaning ‘the Transylvanian Saxon language’) is, linguistically, the most closest relative of the Luxembourgish (in German known as Lëtzebuergesch) from the Moselle-Franconian (German: Moselfränkisch) dialectal branch of the German language, comprising a series of West Central German dialects. It seems that the pattern denomination ‘Saxons’ (or Saxones in Latin) had been given to them because of the fact that they were either poor miners or mere convicts from Saxony.